March was just... very gray. We're happy to welcome Jason Gough to AOA as a contributor. You no doubt know Jason from his many years as a meteorologist on TV here in the Capital Region. He's helping us nerd out on some local weather stuff. Got a question about how local weather works? Send it along! Last time we spoke it was about "the models," the complex sets of atmospheric models meteorologists use to make predictions about the weather -- some of the history behind them, what goes into them, what makes them imperfect. And I promised at the end we'd get to how we use those models to make a final forecast and the ongoing competition between the Americans and Europeans. Since that time, well, it's not been the best March in recent memory. Our highest temperature of the month was 56 degrees, and that was on the last day of the month. We also had our share of snow -- enough to make into the top 10 of snowiest Marches on record. 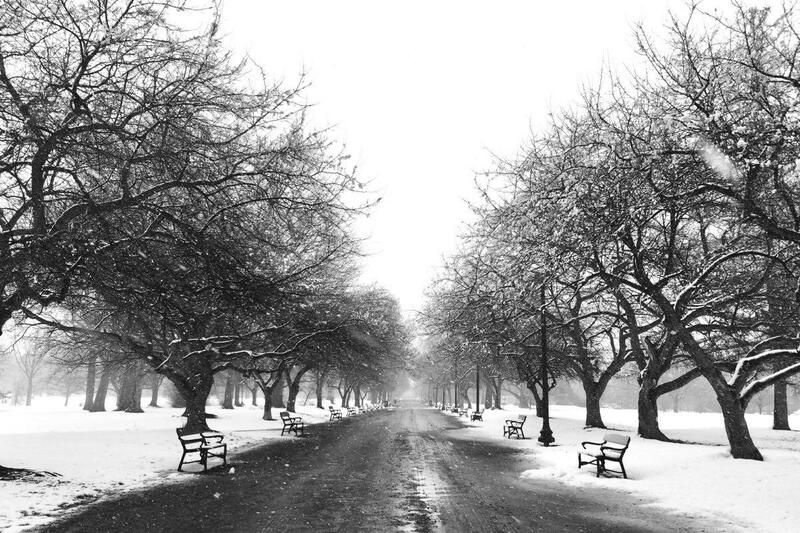 That snow was not easily forecasted. And it piled up. A few times. So let's starting off talk about the first Nor'easter of the month and the forecasts for it. The initial forecasts had the storm moving farther east and some "warmer air" issues. Not much had changed in that thinking through about lunchtime on March 1. 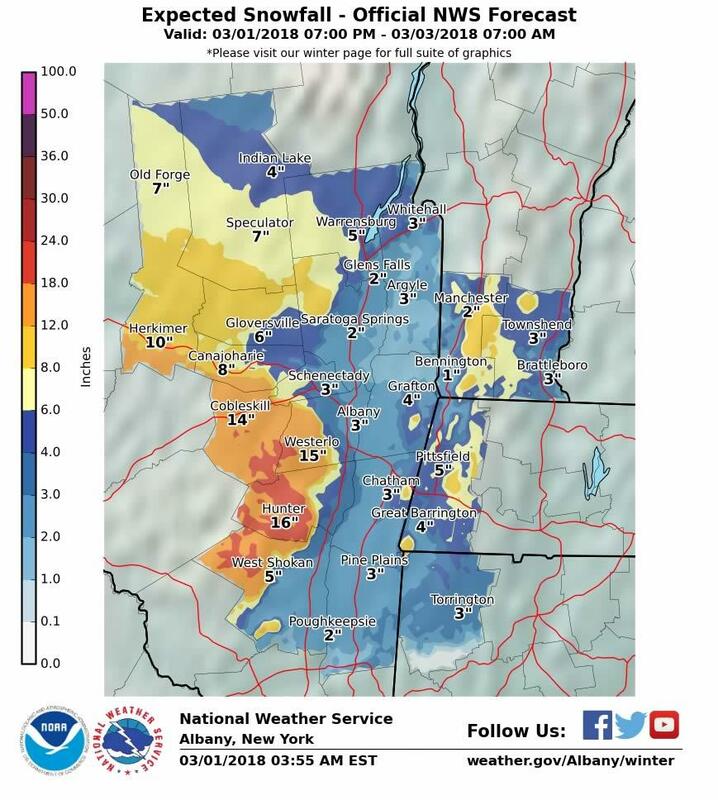 From NWS Albany's probabilistic snowfall forecast maps. But what we ended up with about 48 hours after this forecast was a little different. Now follow me on this: The forecast was right, just too far to the right, you dig? Well actually, a lot of us did dig. So what happened? And what the hell is this Gough guy talking about? A common question I get is: "What is the toughest thing to forecast around here?" The answer is, unequivocally: "Nor'easters," followed by, "If a Nor'easter' jogs 50 miles on either side of our forecast, it can mean the difference between rain, snow, a lot of snow -- or a lot of nuthin'." It's even more complicated than that because weather doesn't just happen on the ground, it happens in the air. We have to watch temperature profiles in the atmosphere to see if things like sleet, freezing rain, or even rain may come in to play. In fact with this storm, the so-called European and American models had warm air moving in overhead, which in turn depicted a mix with/change to freezing rain and sleet. Nothing kills a snow forecast faster than mixing, so it must be accounted for in such a forecast. As it turns out, 20 miles made the difference with this storm. All the heavy snow that was forecast to stay west was in our backyard and it was the New York/New England line that divided the heavy stuff from much lighter amounts. We had no warm air aloft, so no mix and everything fell as snow. We're looking at lots of different things and making educated and informed... I'll say it... guesses. We are not model readers, computers can do that. We use experience and the "feel" of things to put the best forecast out there. Remember that grid thing we talked about last time -- how forecasters are always trying to include as many points of true data as realistically possible for a specific area in order to get the most accurate forecast? We live in "that grid" and small systems like Nor'easters -- well, small in a meteorological sense -- can slip in between those true data points and if the estimates are off, welp, so is the forecast. The other huge piece of this factor is the judgement of the forecaster/meteorologist. We're looking at lots of different things and making educated and informed... I'll say it... guesses. We are not model readers, computers can do that. We use experience and the "feel" of things to put the best forecast out there. So let's talk about those models, specifically the competition between the model known as the GFS and the one called The Euro. The American Model vs. the European Model. The Global Forecast System vs. the European Centre for Medium-Range Weather Forecasts. Both use basically the same data, but they can sometimes get different results. You might remember that fact going mainstream with Sandy in October of 2012. Several days out, the Euro had Sandy hooking west somewhere in the Northeast, while all other models, including the GFS, had it going out to sea. Because the Euro was the outlier, it couldn't be taken too seriously too far in advance. Turned out the Euro was correct and it has had serious (and deserved) street cred since. Both models use what are known as "ensembles." Think of ensembles as a series of what ifs. They take the same model and run it several times with slightly different variable input each time. This gives a range of possibilities and lets you know how "confident" the model is in itself. Ideally, you have a close clustering of the outcomes after running these ensembles through the model. That means high confidence for a forecast to what we call "verify." The GFS is free (NOAA uses our tax dollars for it), the Euro is expensive. It can cost outside users like companies in the US 150,000 Euros (186,000 US dollars) per year or more. The GFS has runs four times a day, the Euro runs twice a day. The Euro is a better-performing model. The blue -- that is, The Euro -- is better. Think of it as the Euro hitting 91% of its forecasts, with the GFS hitting 88%. That might not sound like a big difference, but some days are harder to forecast than others and it's within that 3% that some of the biggest, most notable differences can occur. Sandy is an unfortunate example. While the GFS has improved in recent years, it still runs on slower computers than the Euro. The science behind the Euro forecasting is funded by 31 nations in the European Union and it has more computing power. That means it can use more true numbers and fewer estimates. Case in point about the above "ensembles": the Euro uses 52 for its runs, the GFS uses 21. 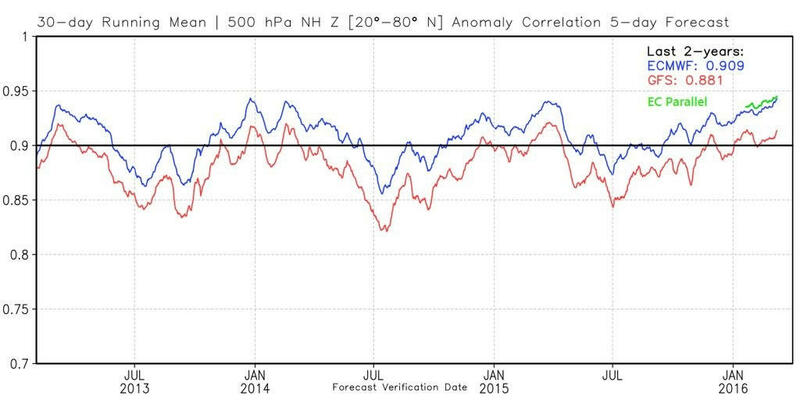 NOAA has declared that developing the world's best global weather model is a top priority. Back in July of 2016, it announced that a new model will replace the current GFS and it'll be better than ever. (The new model will also be called the GFS.) It's currently being run in a test mode before it becomes fully operational in about three years. 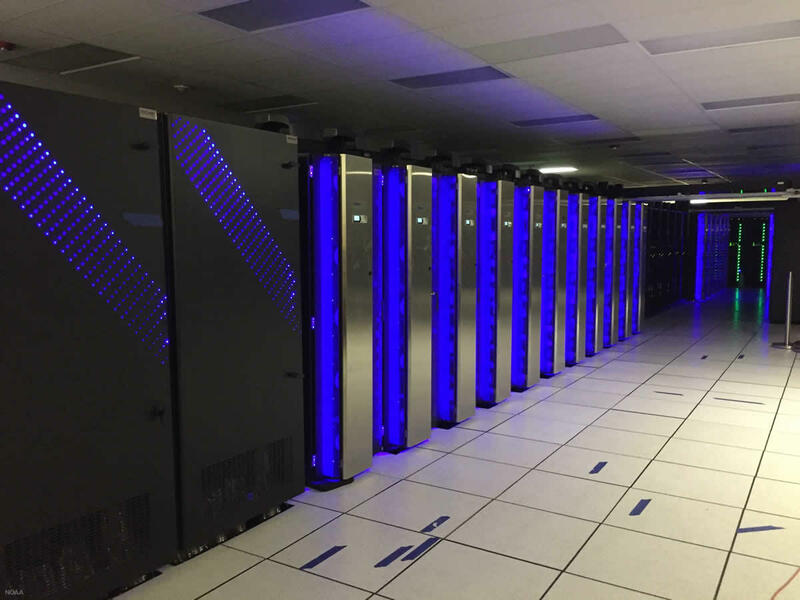 The model will be run on faster supercomputers, which will mean more true data and fewer estimates. Those data will come from lots of sources, including the addition of polar and geostationary satellites. There will also be an emphasis on hurricane forecasting, which is a whole different animal. But for now, this comic pretty much sums it up. Oh, by the way... there's another model that's in use -- the NAM -- but it doesn't have as much weight. It could be argued that it is treated a little unfairly (the nose picking in that comic is a good example). It can do pretty well with local-scale things like thunderstorms. It tends to whiff on bigger things like Nor'easters. All THAT said, it performed well with our first storm of March. Just remember as a forecaster, it's usually a long shot to do that. Next time, I'll get into spring. It's here and it can bring all kinds of stuff to us... good, bad, and ugly. Jason Gough is not a TV meteorologist anymore, but he's forever a weather geek. 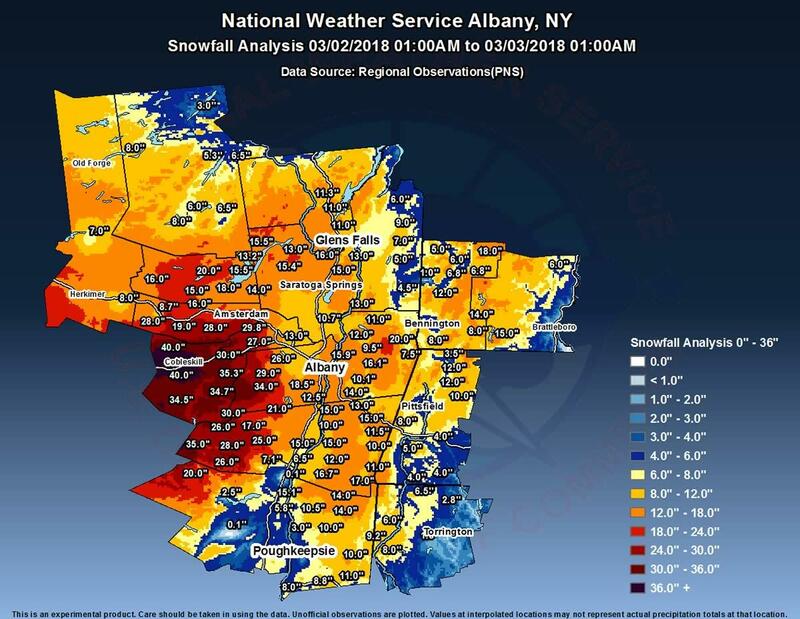 It seems like many of the forecasts miss the local "valley effect" where precipitation is often less than forecast in the hudson river valley around Albany. Thank you for running Jason's column in AOA. I am learning a lot from him. And, I enjoy his writing style. I really enjoy weather related articles and will certainly follow Jason Gough now that he is a contributor to your site. Thank You Jason, enjoyed your explanations. I often read the daily Forecast Discussion from the NWS in Albany and read it even more for my weather since you've been gone from your daily appearances. Would like to see you explain some of the terminology used in the discussion for us amateur Weather people. Like what is a trough and what does it mean when it becomes negatively tilted? Might be boring for some, but I would enjoy your explanation. Thank You again for doing this on AOA! Hi, Not from Albany but just south, here in Stuyvesant, N.Y. I certainly am interested in all that is going on with the weather and all things concerning living in the Northeast as I have been here all of my life. Keep up the good work, I am sure everyone enjoys hearing things we cannot see.for ourselves. Thank you and God Bless!